Infection of a joint or bone with Mycobacterium tuberculosis is almost always secondary to a primary focus, in the lymphatic glands or lungs or mesentery, from where it disseminates by hematogenous route. Malnutrition or any debilitating disease, poor environment increase the incidence of the disease. Patients with immunodeficiency disease or HIV infection are more prone to develop tuberculosis. ii. Intra-articular: It can originate in the bone (osseous lesion) or in the synovium (synovial disease). Vertebral body involvement with tuberculosis is the most common and is nearly equal to tuberculosis of all other regions put together. There may be a history of trauma, under the effect of which a small hematoma may form resulting in vascular stasis in that area. The hematoma may become a nidus for the tubercle bacilli to settle down and form a tubercolosis follicle with caseation, epitheloid cells, gaint cells and fibrosis at the periphery. The lesion in the bone is essentially a lytic lesion which is evident radiologically, unlike in pyogenic infection which is characterized by intense sclerotic activity. As the tuberculous lesions heal, sclerosis takes place. At certain sites like the short long bones and in hand and feet or the clavicle, there is intense sclerotic activity by layer of subperiosteal bone and is characteritic of a tuberculous lesion. The tuberculous pus formed in the medullary canal may travel distally or laterally thus lifting the periosteum, may form an abscess and even burst giving rise to a tuberculous sinus. Multifocal tuberculous is somewhat common and is occasionally. The response to a tuberculous lesion is exudative and may form a cold abscess, which is nothing but a collection of necrotic material caseous tissue and the exudative reaction. These cold abscesses than track through the fascial planes or the neurovascular bundles and may present at a distant site. Since the abscess is away from the area of inflammatory activity, it has no signs of inflammation in the skin overlying the abscess. A superficial abscess may burst and result into a sinus or an ulcer. Granulation tissue is almost always present in the tuberculous lesion. Ischemic necrosis of bone due to endarteritis and thromboembolic phenomenon in bone lead to formation of sequestra, which in osseous tuberculosis happen to be small. Isolated large sequestrate in osteroarticular tuberculosis are rare. It is an extremely common condition in our country and is seen in all strata of society. It can mimic almost any condition seen in bone like chronic osteomyelitis, osteoid osteoma, fibrous dysphasia, malignant/benign tremors. In case of pain, swelling, night cries fever an orthopedics surgeon may be consulted. In case of the symptom like swelling discharging sinuses, paraplegia or the disease not responding to standard anti tubercular drugs the patient may be referred to a higher centre. The tuberculosis of the joints mainly involves big joints. The common differential diagnosis includes pauciarticular juvenile chronic arthritis and septic arthritis. The involvement of joint may be osseous or synovial but if not treated, one would infect the other. Tuberculous synovitis leads to effusion in the joint and synovial membrane becomes edematous. At this stage the joint would look swollen and movements may be present or limited due to muscle spasm. The radiological picture may show an increased joint space. Later on, the granulation tissue may extend from the periphery on to the articular cartilage or in the subchondral region in the form of a pannus thus eroding it. Once the articular cartilage is eroded there is tremendous muscle spasm and all movements are restricted. Because of the destruction of the articular cartilage the joint space on X-ray looks diminished. muscle spasm which may produce a deformity at the joint. Prolonged muscle spasm may lead to subluxation or dislocation of the joint causing further deformity and shortening. If sinus has formed, secondary infection may be superimposed on the tuberculous infection. Fibrous ankylosis may be converted into bony ankylosis either due to complete healing or new bone formation due to superadded pyogenic infection. There are no movements in the joint after bony ankylosis and it is also painless. Radiologically, in bony ankylosis the trabeculae are seen to be crossing the joint line. It is characteristically insidious in onset, and starts as monoarticular or mono-osseous involvement. The child complains of pain in the joint, aggravated by movement, and often wakes ‘up at night because muscle spasm gets reduced and causes pain. It is classically called as “night cries”. Low- grade fever, loss of weight and appetite are some of the symptoms of generalized toxemia usually seen. Joint movements are painful and elicit muscle spasm on attempted movement. In later stages when the cartilage gets eroded, all movements get restricted. Muscle atrophy around the joint is a predominant feature and occurs early. Sometimes an abscess forms which bursts to form a sinus. It may get secondarily infected and may alter the radiological picture. A low hemoglobin, relative lymphocytosis and raised erythrocyte sedimentation rate (ESR) are often found in the active stage of the disease. The ESR is often used as a guide in monitoring the progress of the disease during treatment, though some people do not consider it a reliable investigation. A positive Mantoux test is seen in patients with active tuberculous lesion. A negative test may rarely be seen in severe or disseminated disease or in an immunocompromised patient. It can be diagnostic in view of the typical radiological appearance of the tuberculous lesions. In early stage of the joint disease, capsular markings may become prominent. The earliest sign is widespread osteoporosis around a joint. Lytic lesion and periosteal reaction are seen, although latter is much more prominent in pyogenic infection. In case of joints, small bone erosions occur near the capsular reflection. Joint space decreases due to cartilage erosion and lytic lesions are seen in the epiphyseal area. The radiological signs of a healing lesion are absence of rarefaction and bony ankylosis. Tuberculous pus, joint aspirate, granulation tissue, sputum etc. may be examined by smear and culture for tuberculous bacilli. The culture and sensitivity tests for various anti fuberculosis drugs also help in giving appropriate chemotherapy in resistant cases or cases of multi-drug resistant tuberculosis; which are seen quite frequently in today’s clinical practice. Occasionally, even the most modern methods of imaging may not help the clinician to reach to a final diagnosis, and therefore FNAC or biopsy may be undertaken to obtain tissue diagnosis. FNAC is now available for the cytological diagnosis of vertebral tuberculosis. ‘Biopsy is a safe and a quick diagnostic procedure with high accuracy in the hands of trained cytopathologists. It recommended that it should be practiced in all diagnostic centres of our country, even for suspected vertebral tuberculosis. Biopsy may have to be done in cases where there is doubt about the diagnosis, particularly in the early stages of the disease. Biopsy from the bone or synovium can provide an early diagnosis for timely starting the treatment and preventing damage to the joint. Biopsy from a cystic lesion in bone or from synovium is more likely to be positive. Investigations should also be done to find out the primary focus of the disease. An X-ray of the chest should always be done. Some other investigations may include: sputum smear examination and culture, routine urine examination for isolation of tubercie bacilli and an intravenous pyelogram for ruling out pulmonary and genitourinary lesions, respectively. The patient’s response to treatment is variable as anywhere else in the body and is dependent upon the host resistance, severity of infection, and the stage of the disease when the diagnosis is first made and treatment started. Eradication of the disease and preservation of function are important both in osseous and joint diseases. In case of joints, joint mobility and stability are also the early goals to be achieved. It is possible only if treatment is started early, i.e. when the disease is limited only to synovium. In case the articular cartilage is eroded the joint becomes unsalvageable in terms of function, mobility and stability. In such a situation the aim of treatment is to achieve a sound bony ankylosis which is painless and gives stability, although the patient will not have movements at that joint. Good nutrition consisting of a high-calorie and high-protein diet is essential to build up the resistance. General rest and local rest to the specific bone and joint are essential parts of the treatment. Local rest can be provided by means of splints or plaster casts. However, in cases where the articular surface is not involved a judicious blend of rest and mobilization exercises have to be resorted for restoration of function. Most of osteoarticular lesions would respond to antituberculous drugs if the therapy is started early. However, in case of persistently draining sinuses which are secondarily infected, suitable broad spectrum antibiotics have to be given. About 15% of patients do not respond to chemotherapy alone if the lesion contains much caseation and sequestra. In such situations excision of the diseased focus not only removes the diseased toxic material but also increases vascularity and allows the anti-tuberculosis drugs to reach the site of the lesion. A standard drug regimen is given which includes rifampicin, pyrazinamide, ethambutol, isoniazid, and in some cases even streptomycin. The latter is useful because it kills the rapidly multiplying extracellular tubercle bacilli in the lungs for the initial six months. After two clinically and radiologically, pyrazinamide is stopped and isoniazed, rifampicin and ethambutol are continued for one year. In some cases therapy may be required for 18 months for complete healing of the lesion. In case the infection is suspected to be with multidrug resistant ofloxacin, capreomycin, kanamycin, etc. may have to be given. Doubtful diagnosis requiring excision of the focus or curettage of the lesion. An abscess or a lesion increasing in spite of adequate chemotherapy. Synovitis not involving the articular cartilage; synovectomy should be done to prevent the latter from getting eroded. Curettage of a lesion in proximity of the articular cartilage to prevent the latter from getting involved. The general principle of surgery in tuberculosis demands that the abscess should be completed evacuated. In case of an osseous lesion, all sequestra, granulation tissue and caseous material should be removed till new bleeding bone is encountered, so that the antibiotics may reach the site of lesion better. The cavities so produced should be packed with autogenous bone grafts. Avoid dead spaces to prevent hematoma formation and close the wound primarily with or without suction. 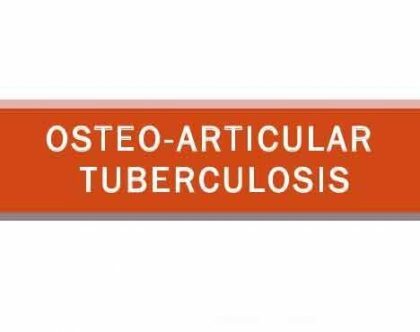 Tuberculosis can involve any bone or joint of the body but in children it has a special predilection for the hip and knee joints commonly, and for ankle and elbow joints rarely. Tuberculosis of spine with or without paraplegia is extremely common. Long bones are rarely involved but the short long bone involvement is somewhat common. Nurse – General care like nutrition advise, care of the wounds. Technician – Radiographic examination microbiological examination.